Ryan Rips Obama, Sets Table For Romney : It's All Politics With a jutting chin and growing fearlessness, Republican vice presidential candidate Paul Ryan delivered a GOP convention takedown of President Obama Wednesday night, catapulting an already ugly campaign to a whole new level. "A ship trying to sail on yesterday's wind," was one of many ways he put it, to the roar of those who packed the Tampa arena. Later, he referred to "the fading Obama poster" in the room of the mythical 20-something who can't find work and is still living with the parents. To hear Ryan tell it, four years never seemed so long ago. It was clearly plenty of time for a true and public rivalry to develop with Obama, 51, Ryan's nemesis since the men locked horns over the president's health care overhaul. 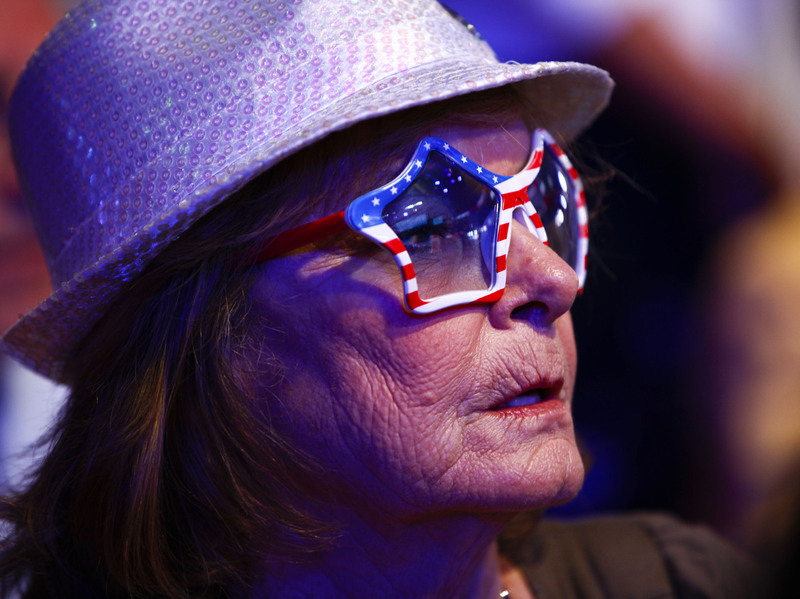 Carol Hurst of Merritt Island, Fla., listens to a speaker on Wednesday at the Republican National Convention. 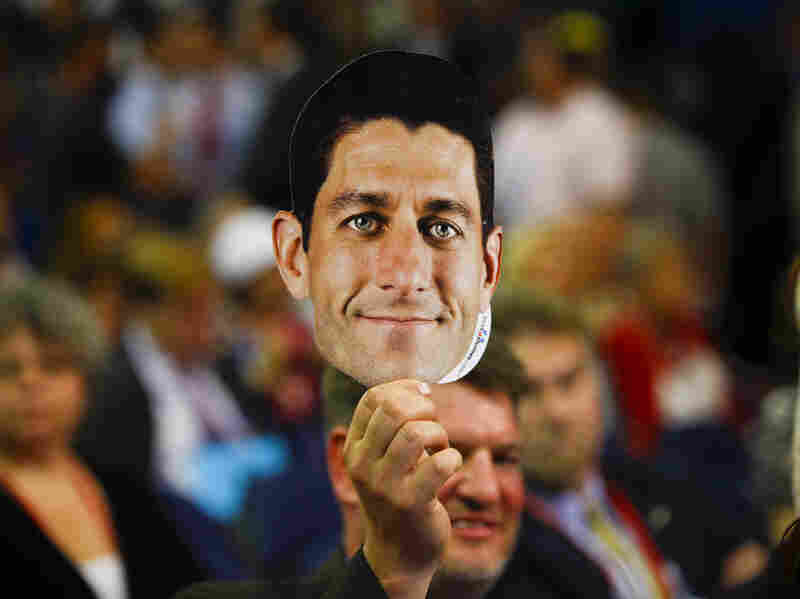 And if there remained any question whether he and GOP presidential nominee Mitt Romney, who will speak Thursday, will attempt to turn the debate over Medicare changes to their favor, Ryan dispelled it. 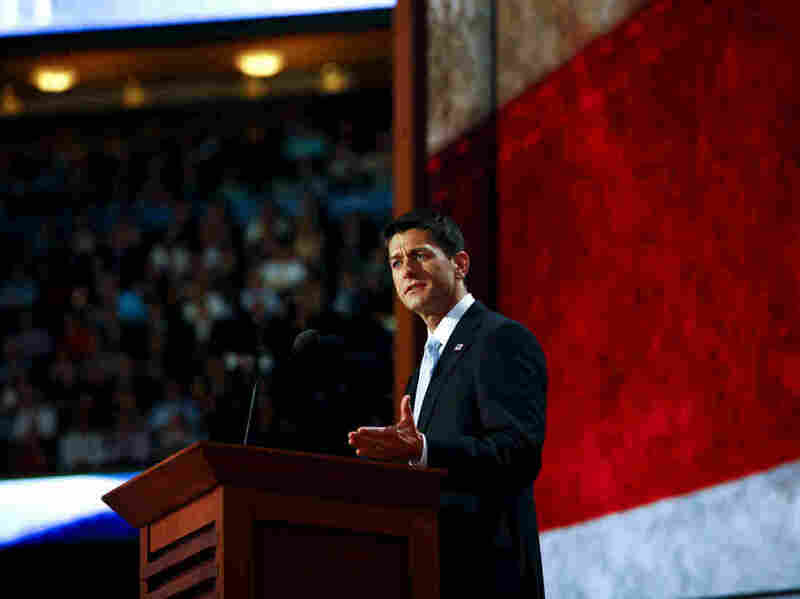 Ryan also provided context better than anyone has at this week's convention for the GOP blowback Obama has received for his "you didn't build that" line in a recent speech, during which he asserted that government plays a role in business success. "All the corner shops in our towns and cities, the restaurants, cleaners, gyms, hair salons, hardware stores — these didn't come out of nowhere. A lot of heart goes into each one. And if small-business people say they made it on their own, all they are saying is that nobody else worked seven days a week in their place. Nobody showed up in their place to open the door at five in the morning. Nobody did their thinking, and worrying, and sweating for them. After all that work, and in a bad economy, it sure doesn't help to hear from their president that government gets the credit. What they deserve to hear is the truth: Yes, you did build that." While it may very well be true that Obama's comment was taken out of context, and that, indeed, government does play a role in creating a climate and infrastructure businesses need, this argument, as laid out by Ryan, looms large and problematic for the president. A delegate shows his support for Paul Ryan on a night dominated by the acceptance speech of the vice presidential nominee. But the speech seems destined to become a template for the campaign going into the final weeks. "It's like a big pep rally," said Sara Canady, an alternate delegate from Texas, over the roar of the crowd. "He's preparing us and motivating us to go home and share this message." Said Paul Hurst, a delegate from Hawaii: "He clearly defined Gov. Romney and provided a clear contrast to the current president." If the current president was watching Ryan Wednesday night, he would be left with little doubt that it's on. Again.